According to a study conducted by a Boston, Massachusetts-based mobile advertising company, Jana, Amazon was the most searched-for e-commerce retailer in India during the second half of 2017, way ahead of its nearest rival, Flipkart. 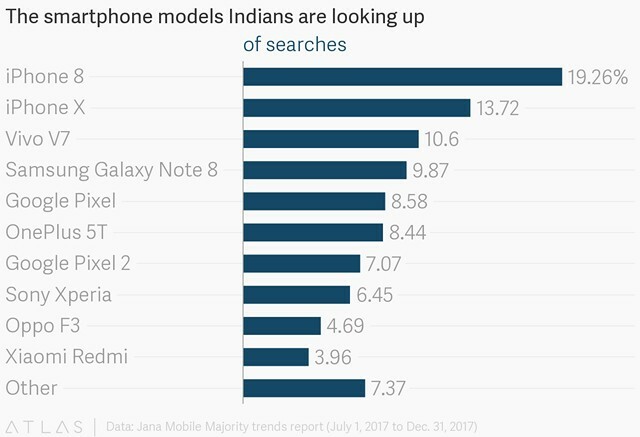 As per a report by Quartz that has exclusive access to the study, 46.02 percent of e-commerce-related mobile searches on Jana’s mCent browser were for Amazon, while only 20.9 percent of the searches were for Flipkart. The rest of the searches were for other retailers, such as eBay, Snapdeal, Shopclues, Myntra and others. It is worth pointing out that these searches do not really reflect all mobile searches in the e-commerce category that originated out of India during the period. As mentioned already, Jana only took into account the searches that were conducted through its own browser, mCent. Which means that searches about e-commerce portals from the vast majority of netizens, who use Chrome, Firefox, Safari, or even Alibaba’s UC Browser (yes, it’s a thing in India), were not considered for the study. It’s difficult to say if the results would have looked a lot different if we had access to all that data, but the limited data that we do have, seems to suggest that Amazon is doing a pretty decent job of competing against Flipkart in a country that Jeff Bezos and his team have high hopes for. Either way, the study also suggests that Amazon Echo is leading Google Home not just in global market share, but also on mobile searches in India, at least on mCent. Apparently, 94.42 percent searches for smart home products are for Amazon products (including the Echo), while the Google Home languished at 5.5 percent. Another interesting trend unearthed by the study is the sheer volume of searches for Apple’s iPhones. Apparently, iPhone 8 and iPhone X were the most searched-for phones on mCent in India during H2, 2017, with the relatively obscure Vivo V7 being the highest-rated Android handset at number three. As for streaming devices, Roku – a streaming stick not yet officially available in India – came in at number one in terms of total searches, followed by Apple TV, Google Chromecast, and Amazon Fire TV.